Three adults and three children are dead after a two-alarm fire in East Baltimore early Tuesday, according to fire officials. Fire Department spokesman Kevin Cartwright said a blaze was reported at 4:45 a.m. in the 2300 block of Homewood Avenue, and units arrived just before 5 a.m. Firefighters entered the building but conditions deteriorated due to wind, he said, so the incident commanders ordered them to evacuate and fight the fire from outside. "Wind intensified conditions," Cartwright said. Once the fire was under control, firefighters performed search-and-rescue operations and discovered the bodies of six people, the spokesman said. According to a relative, Elnor and Richard Satterfield died in the blaze, along with their granddaughter Tiara Gholston, 26, and her three children, Amari, 9, Darryon, 3, and Daelyn, 1. Property records list Richard Satterfield and his wife as owners of the house. City schools spokeswoman said that a crisis team went to Cecil Elementary School this morning because one of the children was a student there. 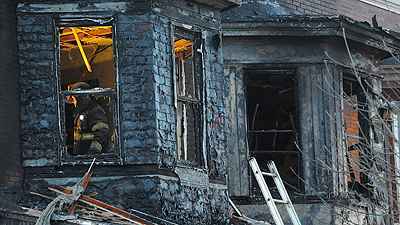 The fire caused heavy damage to the Satterfields' house and another at the end of the block, in the East Baltimore Midway neighborhood just east of Greenmount Avenue and south of 25th Street. Two other houses next door were also damaged in the blaze. Investigators are working to determine the cause of the fire and where it began, Cartwright said.